We’ve heard the voices of our members – the hundreds of thousands of parents, teachers, students, administrators and community members who are outraged at the senseless shooting at Marjory Stoneman Douglas High School in Florida that took the lives of 17 students and faculty members. Our students across the nation are using their powerful voices to ask for meaningful policy changes at the state and federal level to address the all too common issue of gun violence that is affecting them in the place they should feel safest: their school. Another National High School Walkout is planned at 10 a.m. on April 20, which will mark the 19th year since the shooting at Columbine High School in Colorado. 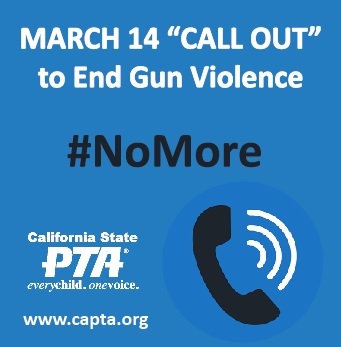 California State PTA supports the rights of students to express themselves on campus through organized demonstrations, but believes that care must be taken to ensure the orderly operation of the school is not disrupted and the physical safety of students is not threatened. Leaving during school hours to attend an off-campus demonstration places the student outside the safety zone of the school and unnecessarily jeopardizes that school’s education funding. We entrust our students to their school leadership to ensure a safe environment for their voices to be heard. Be sure to talk with your local school district about possible student demonstrations that may affect your school or community. The safety of our members and students needs to be a priority when evaluating participation in any event.